Ready for another fall collection review?? 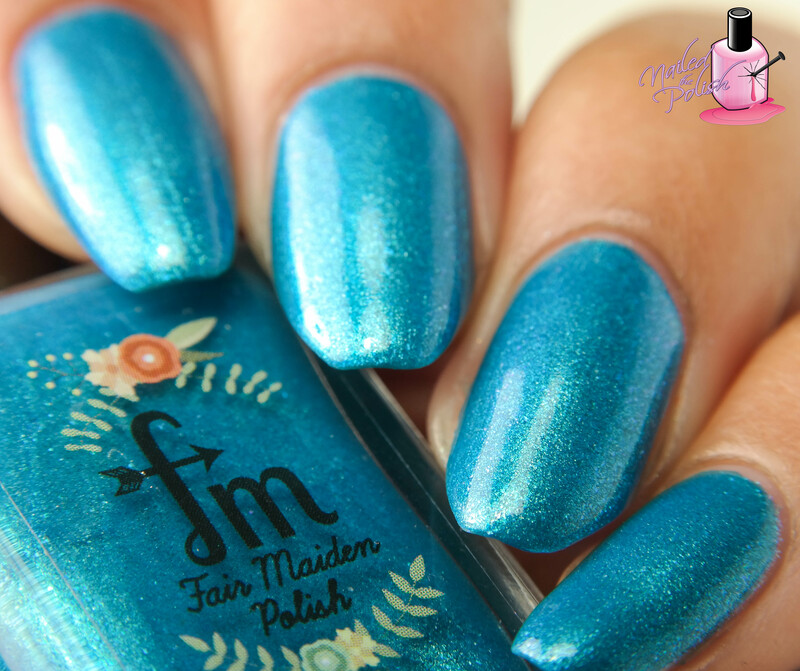 🙂 Today I’ll be sharing swatches of Fair Maiden Polish‘s Swords and Lace: A Renaissance Fantasy, Fall 2015 Collection! 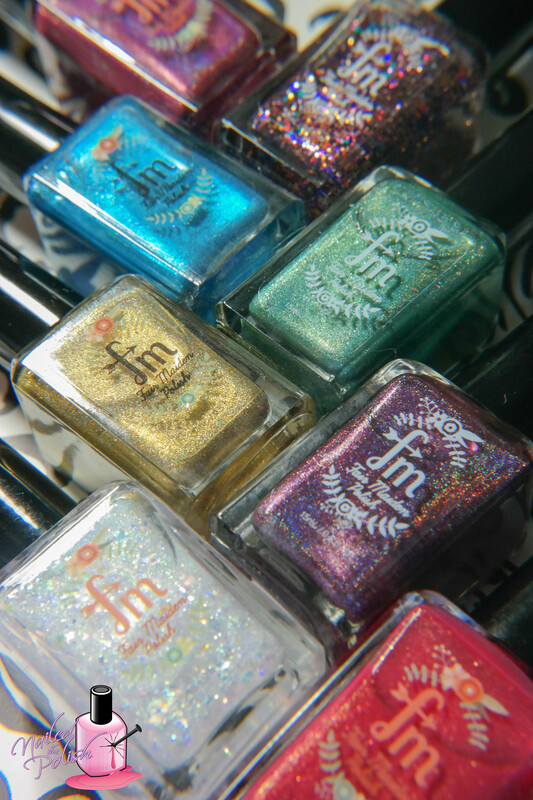 This collection consists of eight polishes – two shimmers, four holos, and two toppers. This collection launches tomorrow, September 19th, at 12:00pm CST! As usual, all swatches were taken indoors under a combination of Cree daylight and LED bulbs using a Samsung NX300 camera. Belly Dancer is a dense jewel toned glitter topper full of bronze, dark blue, green, pink, red, and purple glitters of various shapes and sizes. This can be worn alone or as a topper. Shown here is one coat over OPI’s Tiramisu For Two plus top coat. This polish has an amazing glitter to base ratio! 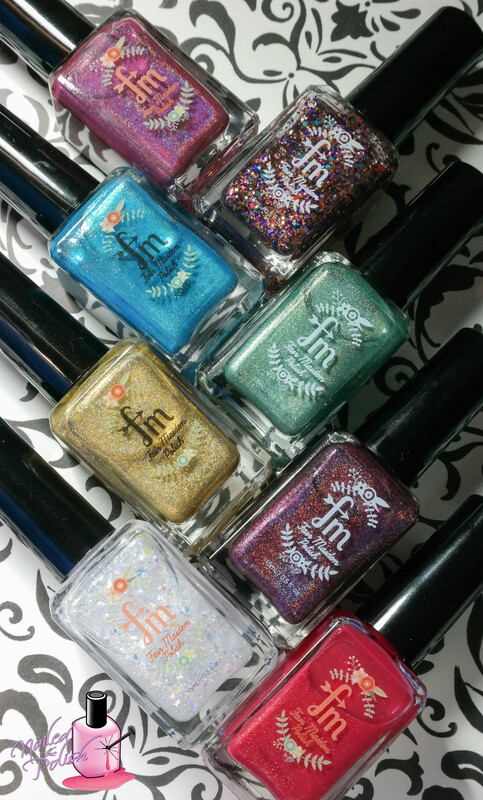 It also has a great glitter distribution – I was able to get almost each type of glitter in just one coat. I think this is such a fun glitter topper! Look at all those glittersssss! High Priestess is a strawberry red creme with gold and pink/orange shimmer. Shown here is two coats plus top coat. Such a great formula! Super easy to control with great coverage. I barely had to do any clean up! The shimmer is so gorgeous and vivid in person but unfortunately, my camera did not want to cooperate very much. 😦 I was able to take a nice bottle shot though to showcase all of the wonderful shimmer! You can see the gold and pink/orange shimmers towards the tip of my nail. Here is what the shimmer actually looks like! This Pirate Queen is also a beauty queen! Crystal Ball is multi color shifting iridescent flake topper with soft gold shimmer. Shown here is ONE coat over black plus top coat. This polish is packed full of flakes. And when I say packed, I mean PACKED! Since it is so packed, the polish is a bit thick. With that being said, to make application easier this polish comes with a wide brush rather then the standard brush. Genius! I love this topper! It’s so unique! I am dying over these flakes! And the shimmer! I also decided to pair Crystal Ball with Masquerade. Snake Charmer is an emerald green linear holo with added gold shimmer. Shown here is two coats plus top coat. Amazing formula! I think this shade of green is pretty darn perfect. It’s bold yet muted so it’s a polish that you could easily wear all year round. … and another for the holo! The Archeress is a gorgeous metallic gold linear holo. Shown here is two coats plus top coat. This polish right here has taken a piece of my heart. Gah, it is SOOO gorgeous. 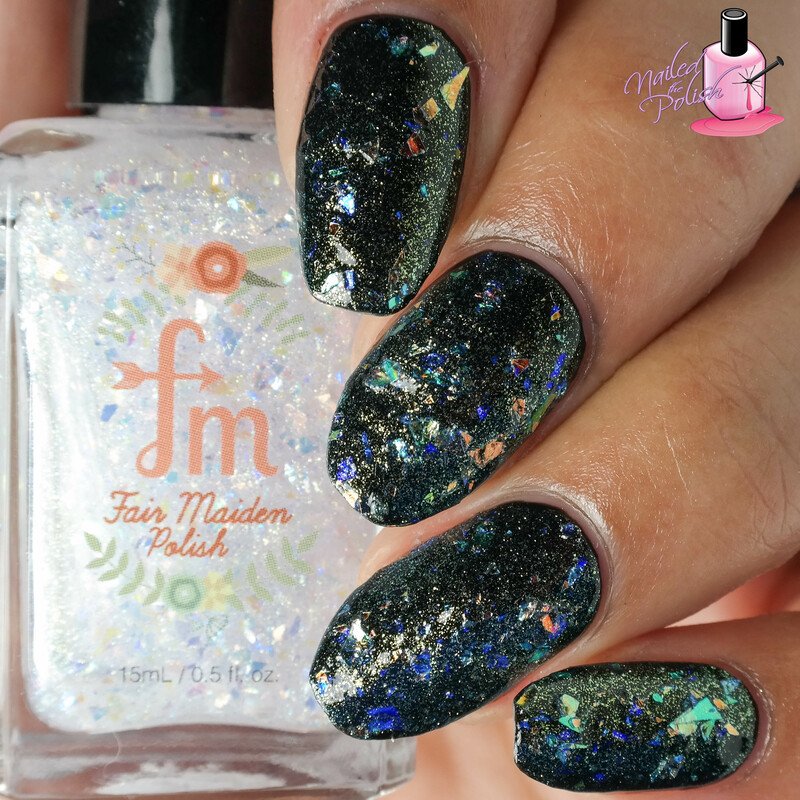 The metallic essence brings this holo to a whole other level. Formula is wonderful (duh). If you’re careful with application, it could be a one coater for sure! Yes, this is real life! Hey look! There’s also gold micro flakes! 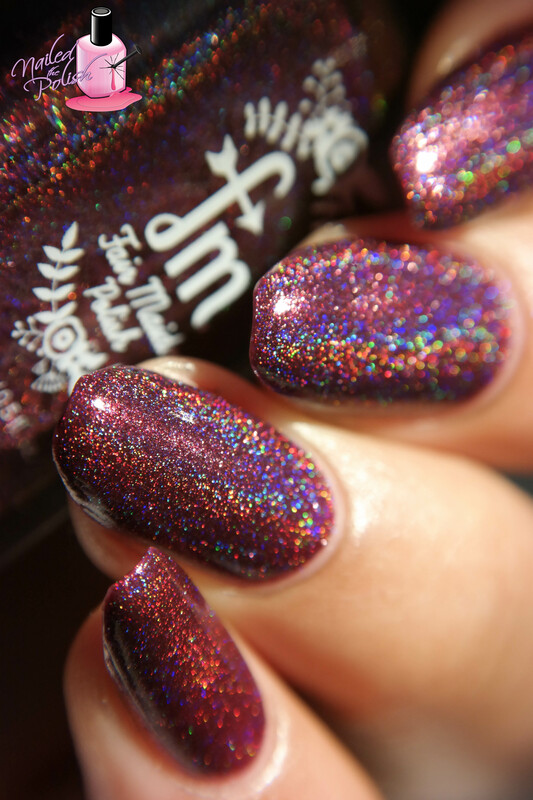 Last up is Just A Mirage – a deep burgundy wine intense linear holo. Shown here is two coats plus top coat. This polish was originally created for Cosmoprof but Adrienne and Sarah couldn’t resist adding it to the collection and I’m glad they did! This polish is a stunner! The holo is SO intense and the formula is perfection! This is an absolutely wonderful collection! I love the mix of colors and finishes not to mention the names are perfect! Overall, I am very, very happy with the formula on these polishes. While Crystal Ball is a bit thick, you can hardly tell with the wide brush. Control and consistency is amazing. Not once did I have any cuticle flooding and with each swatch, I barely had to do any clean up! My picks would be Just A Mirage, The Archeress, and Snake Charmer! This collection will be available for purchase here tomorrow, September 19th, at noon CST. Individual polish prices range from $9.00 to $11.00. You’ll want to set your alarms if you’re interested in buying any of these shades because typically Fair Maiden collections go fast! 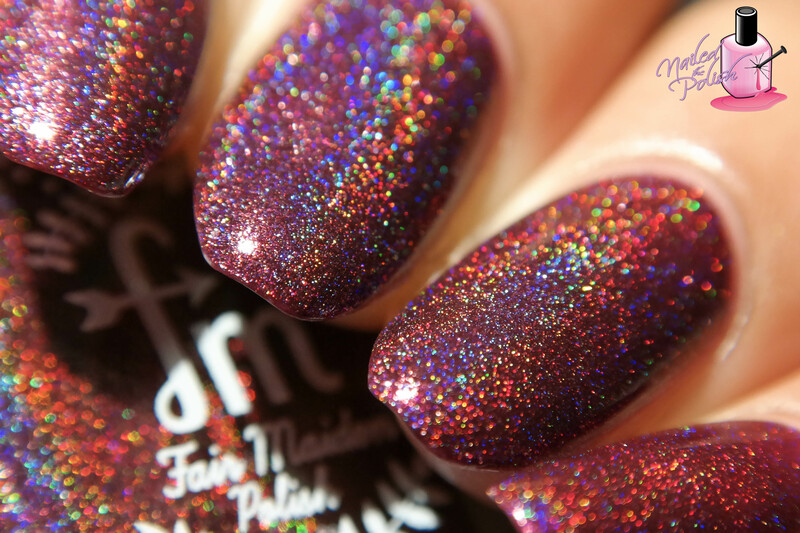 Also releasing tomorrow are Fair Maiden’s new matte and top coat! The It’s Magic! 2 in 1 top coat also doubles as a base coat. While it is not fast drying, it is very glossy and has a nice formula – not too thick, not too thin. Which shades are you digging? Planning on purchasing any? Let me know in the comment section below!